Das groÃƒÆ’Ã…Â¸e Finale bei Scrapjacked – hier ist mein Layout zu Missy. Hat echt SpaÃƒÆ’Ã…Â¸ gemacht, obwohl dies eher gar noch so mein Stil ist – also normalerweise – meine ich – LOL. This is the grand finale at Scrapjacked – and here is my take on Missy’s Layout. It was really fun although it is not exactly my style – I mean usually – LOL. 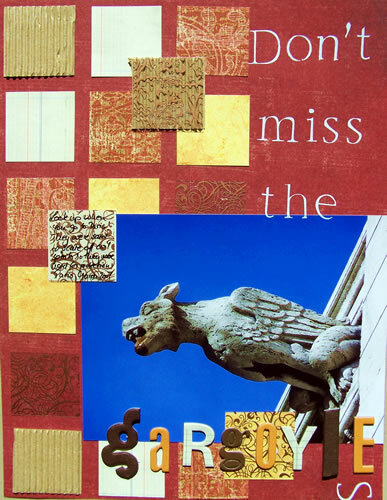 Don’t miss the Gargoyles. Look up when you go to Paris. They were said to scare evil spirits so they were used for protection. Paris, March 2007.I loved those gargoyles all over the place. supplies: Fancy Pants Paper, Basic Greay Paper, Currogated Cardstock, Autumn Leaves and K&Co, Hambly Screen Prints Overlay, Making Memories Rub Ons, Bazzill Chipboard letters and Heidi Swapp Chipboard Letters. ich finde es sooo klasse!! Lol, das ist ja cool! Du kommst immer auf Ideen :) Super!